On the cover: This man's got an issue (in more than one sense). Japan's cellphone giants are about to conquer the planet, right? Wrong. We're not talkin' boomboxes and Walkmans here -- software integration and internationalization are serious barriers. The Inter-Cross Creative Center is in Sapporo -- in the middle of nowhere, some Tokyo-ites would say. For the free-spirited inhabitants of ICC, that's the best place to be. A "business innovation center" in Osaka stands somewhere between entrepreneurial incubator and pork-barrel spending. A new service lets Japan's long-gouged phone users more easily pick and choose carriers, but NTT isn't too worried. A look at the top search terms on the sites of some popular Japanese tech magazines reveals some interesting trends. An innovative Java handset game shows the growing sophistication of the wireless content business. A professor of international business strategy, he's fostering -- and giving grades to -- tech ventures in Kyoto. 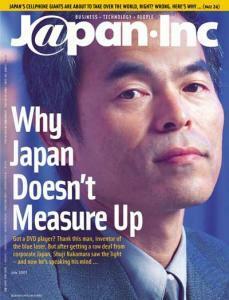 This editor in chief is heading up a how-to magazine for Japan's ever increasing number of entrepreneurs. The rising number of Net users, where people surf, MP3 behavior, and the BS element to interactive TV. How romantic are the Japanese? With the game console market maturing and its revenues slowing, Hokkaido-based developer Hudson Soft turns to the wireless Web. Cellport Systems hopes Japan's drivers will adapt its "server and cellphone-docking station" set-up. This month: Venture Republic, CA Mobile, APAS, Net Seeds. Kenji Yanobe's works suggest the digital, but they're handmade and analog. Hand drills, cotton work gloves, serving trays, playing cards, furoshiki, and uchiwa -- some stuff never gets old.